We give you the option of submitting a ticket by simply accessing this link. You can also submit a ticket by simply sending us an email. We utilize facilities in Bucharest, Romania (Voxility Datacenter). More info here. Can I do a speedtest or do you have Looking Glass? Yes, we have Looking Glass here. What’s the summary of what’s not allowed on the servers? No, we do not offer domain registration or transfer services at this time. If you would like to upgrade or downgrade your service, we have a convenient process to do just that. Find the product or service you wish to change and click on View Details. Click on Management Actions > Upgrade/Downgrade. Choose the upgrade or downgrade desired and complete the order. Our system will create a new invoice for you to pay for the remainder of your current billing period. Your next billing period will reflect the full new amount. OpenVZ VPSs are instantly upgraded upon receipt of payment. 128MB upgrade invoices are inaccurate. Please open a ticket in order to upgrade a 128MB VPS and mention the plan you want and the billing cycle you want to pay on. *Note: If you have a customized VPS with more than the default disk space, please contact us before updating. You may accidentally decrease your disk space with the method above causing your VPS filesystem to become corrupt. Invoices are generated 5 days before their respective due date. Yes. Each additional IP address costs $2 per month. You can order one extra IP address during VPS purchase. If you need more IP addresses please contact support. Do you have cPanel on your VPS servers? There is no control panel on our VPS servers by default. You can request cPanel license during VPS server purchase and our support engineers will install cPanel on your VPS server for free! What’s the cPanel Disk Quotas (OpenVZ)? In order to use disk quotas for cPanel on OpenVZ, you need to have second level quotas enabled for your VPS. We have to do this on our end. Please open a support ticket requesting that we enable second level quotas and include your estimated number of users. How do i create a rDNS record? 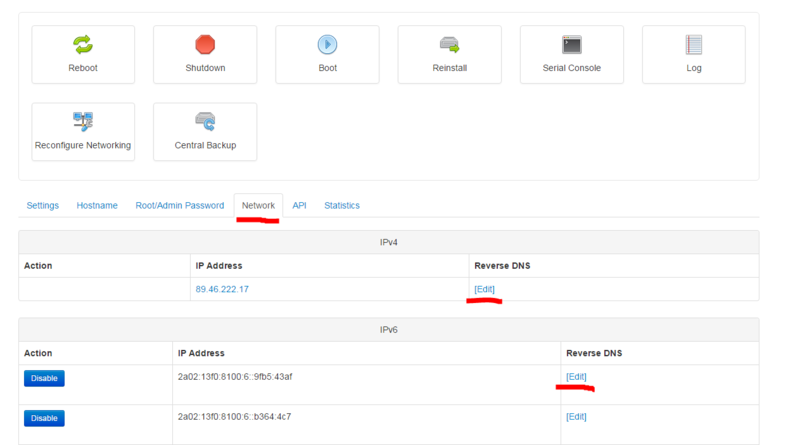 You can manage rDNS for both your IPv4 and IPv6 on your own, without having to open a ticket. Login to Clientarea, Services, My Services, select any VPS, scroll down and click on Control Panel, Manage and select the Network Tab. You can enable TUN/TAP from the SolusVM control panel. Click Manage > Settings > Enable TUN/TAP. *Note: Enabling TUN/TAP also enables certain settings required for IPsec and dnsmasq. Log into SolusVM and Enable PPP. Reboot if needed and repeat the last line above.